The RIT Rock Climbing Team placed fourth in the 2013 Collegiate Climbing Series National Championship last April in Melbourne, Fla. 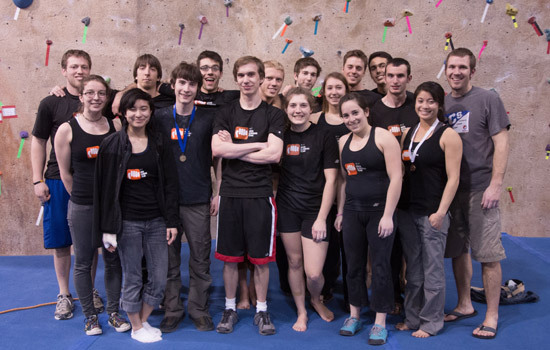 The Rochester Institute of Technology rock-climbing team recently took fourth place in the 2013 Collegiate Climbing Series National Championship in Melbourne, Fla. The team improved from a 7th finish in 2012 and an 11th finish in 2011. Several RIT students also excelled in the individual competitions, including Bryce Viola, a first-year applied mathematics student from White Plains, N.Y., who won the national title in bouldering, and Ethan Criss, a fifth-year computer science master’s student from Collegeville, Pa., who placed third in the speed climbing discipline. The student team of nine competed in April against 31 schools from across the country, including third-place Georgia Tech, second-place University of Colorado, Colorado Springs and first-place University of Texas. Team scores were made up of the top male and female climbers in each of the three disciplines of climbing—speed, sport and bouldering. “In the speed competition you essentially have to climb a 35-foot wall as fast as you can,” says Criss, who completed the wall in 8.34 seconds, just 0.3 seconds behind the winner. In the bouldering competition, climbers were tasked with completing three different boulder problems, with a five-minute rest between each problem. Each move is worth points, while finishing the problem earns bonus points. In the sport discipline, competitors climb a long, difficult route, earning points for the highest hold obtained, with bonus points added for finishing the entire climb. 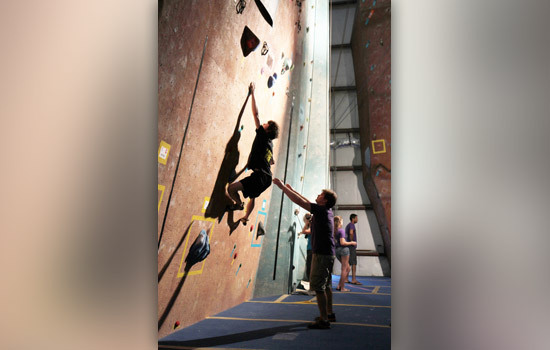 RIT’s indoor rock-climbing gym is located in the Interactive Adventures Red Barn on the west end of campus.